APPLICATIONS FOR 2019 SCHOLARSHIPS ARE NOW AVAILABLE! 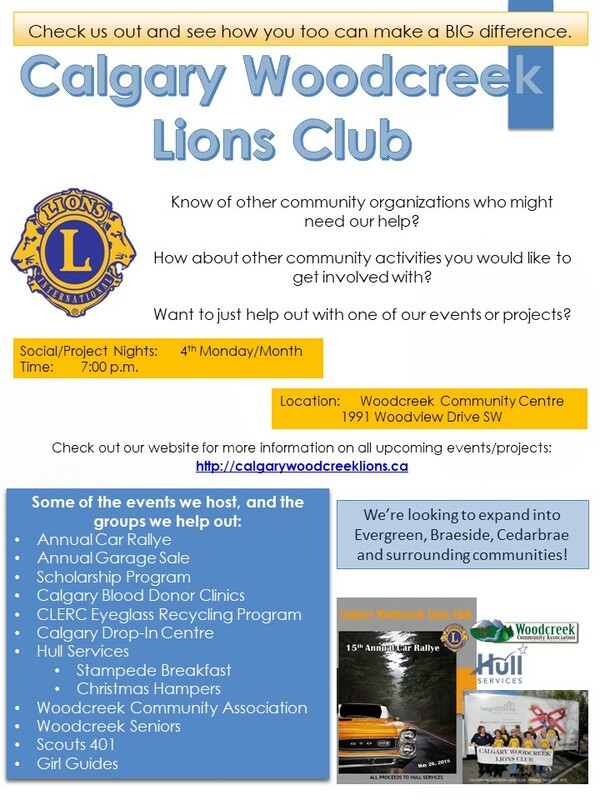 The Calgary Woodcreek Lions Club has loyally served the Woodcreek and Woodbine areas of Southwest Calgary for 16 years. We expand our reach as we see the need. We are a smaller club but an active and fun group who likes to roll up our sleeves and get things done. This year we are trying a new format. We are moving from a meeting based to a project based club. We are hoping that more people would like to help with any of our various projects and events. We are always on the lookout for opportunities to participate in various projects, to serve our community, and to expand into other communities. We work with Hull Services who provide highly valued behavioral and mental health services for local children and families. Check them out here. If you are interested in learning more about our upcoming events and projects, check out out Club Projects page. The 4th Monday of every month is a social night where we will do something fun. Check out the calendar for information. Lions around the world have been changing lives for 100 years through humanitarian service. Our Centennial Celebration is a time to mark this milestone, celebrate our legacy and look forward to the next century of service. The challenge went out to all clubs to step up our service and the goal was by the end of the celebration in 2018 to serve 100,000,000 people. Well guess what? We beat that goal more than a year early. This is the Facebook page for the Calgary WoodCreek Lions. We hope you visit it, comment and please 'Like Us' to increase the popularity of our club.